How things have changed! 10 years ago we told you that software RAID (redundant array of independent disks) was underpowered and incapable of providing the performance required to service enterprise RAID applications. Back then, software RAID was just not a viable solution. But... that has begun to change – in a big way. With more and faster CPU cores available, RAID can run at speeds matching solutions that sell for hundreds of dollars more. Since the processor load is very low — in some cases less than five percent of the CPU — software can now deliver a full-performing RAID subsystem. Yes, things have changed. Software RAID solutions running on the Intel® Xeon® Processor E5-2600/2400/1600/1400/4600 with the Intel® C600 series chipset (Romley platform) now equals or outperforms hard-ware RAID. Combining the Intel® RSTe 3.0 driver running on the Intel® Xeon® Processor E5-2600/2400/1600/1400/4600 with the integration of Serial Attached SCSI (SAS) and SATA controllers into the Intel® C600 series chipset can increase overall IO system performance and greatly reduce the overall solution costs incurred in previous generation solutions. With SAS (and SATA) functionality integrated into the server chipset, IT administrators can experience the full performance, reliability, and cost-efficiency of server storage. Advantages of SAS integration on the chipset for OEMs include a reduction in total cost of ownership (TCO), a reduced bill of materials (BOM), and fewer devices, leading to better real estate management on the mother-board. 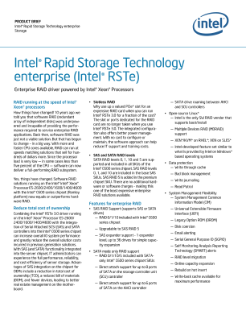 Why use up a valued PCIe* slot for an expensive RAID card when you can run Intel® RSTe 3.0 for a fraction of the cost? The slot or ports dedicated for the RAID card are no longer taken when you use Intel® RSTe 3.0. The integrated configuration also offers better power management.